Pathway of Fire Carved By Time - Meets Wine Culture Made by Man! Fly North via the famous Huka Falls, following the Waikato River over the colourful Wai-OTapu & Waimangu geothermal regions. Overfly the summit of the dormant and spectacular volcano Mt Tarawera, revealing the massive rift left by the 1886 eruption, the largest eruption in our recent history. En route to Whakatane view the picturesque Tarawera Falls before landing to meet and be briefed by the team from Frontier Helicopters - the White Island Tour Specialists. During this comfort stop Frontier will provide you with a safety briefing and safety equipment prior to flying you on the next short leg of your guided tour to the active geological giant - Whakaari (White Island). Have you ever wondered what it is like standing on the edge of a live volcanic crater? 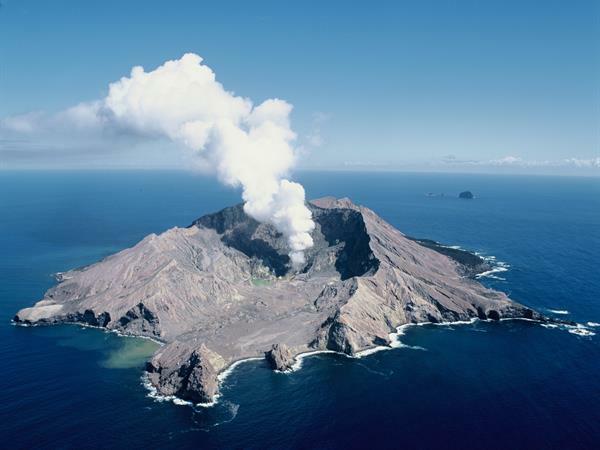 A guided walk with your pilot over the island’s moon like crater floor reveals active steam vents, hot streams, colourful sulphur formations and the steaming crater. View the remains of a sulphur mine which will impress upon you the hard life endured by factory workers who once resided here. As New Zealand’s most active volcano the landscape can change daily. Return to Whakatane, approximately 15 minutes flight time, to land and refresh before reboarding your INFLITE helicopter for the next part of your journey. Continue on south east to the famous Hawke’s Bay region, landing at two wineries. Take the opportunity of tasting superior NZ wines and learn a little history on the viticulture industry of NZ. Lunch can be booked at one of Hawkes Bay’s famous winery restaurants or we can take a picnic and land on a remote beach. After lunch fly west via the beautiful Kaimanawa Forest Park and Mohaka River, search for the famous Kaimanawa wild horses and you may even spot wild deer. Land next to the renowned crystal clear Rangitikei River to enjoy the solitude the wilderness offers. Return to Taupo via the volcanic activity areas and craters of the spectacular World Heritage Tongariro National Park and the pristine waters of Great Lake Taupo.